Sheffield, 16th July 2015 – Mapping Innovation Report released. 2Bio’s Impact Data Metrics team, are co-authors of ‘Mapping Local Comparative Advantage in Innovation’ together with partners at the European Institute for Urban Affairs. This research has established a comprehensive framework for innovation indicators, and using the Impact Data Metrics platform, has added new datasets for the UK’s Local Economic Partnerships (LEPs) to build their future innovation strategies upon. Posted in News on July 17, 2015 by impactscienceip. The National Institute for Health Research (NIHR) invites applications to its Invention for Innovation (i4i) Programme. There are two types of award: Product Development awards and Challenge awards. The NIHR is the research arm of the NHS and funds these awards for companies to develop R&D plans in collaboration with a university or an NHS organisation. Product Development awards support R&D of medical devices, active implantable devices and in vitro diagnostic devices. Lead applicants may be from academia, industry or an NHS organisation and must be based in England or Wales. Calls are repeated two times per year. 􏰀 Trauma and Critical Care. The deadline for outline applications for all calls is Wednesday 27 May 2015 1:00 pm. Posted in News on March 30, 2015 by impactscienceip. Innovation & IP Manager for the Healthcare Sector, based in Liverpool, UK. 2Bio Ltd. is seeking a highly motivated individual for the role of Innovation & IP Manager within our Impact Science Team, which provides innovation and commercialisation support to hospitals, universities, research organisations and private technology-based companies. In this role you will use your expert knowledge to directly support the evaluation, development, and implementation of our client’s innovative ideas and inventions, and explore their commercialisation and protection when appropriate. You will deliver innovation support to an established portfolio of clients, working with a high degree of independence, and you will be encouraged to help grow the portfolio in both scale and scope. You will be working with a diverse range of UK and international clients. We are a successful independent consultancy based in the North West of England, and have a proven track record of delivering commercialisation support – specialising in the life sciences and healthcare sectors, and their associated technology areas, including Pharmaceuticals, Biotechnology, Medical Devices & Diagnostics, IT & Software, and Healthcare Systems. You will have a University honours degree in a science/health subject and with at least a 2.1 grade, ideally you should also have a higher degree. You will have an interest in the healthcare sector, and an understanding of the role that innovation and technology plays in its good functioning. With informal training provided ‘on the job’, you will quickly be capable of performing evaluations of intellectual property (and other innovation assets) including their technical and commercial merits. You should be able to engage confidently and sympathetically with our clients’ innovators and inventors, and ideally you will have a robust understanding of clinical practices and the associated technologies. You must be able to demonstrate excellent documenting, communication and project management skills. Posted in News on March 5, 2015 by impactscienceip. Impact Science has recently performed an analysis of the patent output from the N8 universities in Northern England, inspired by the current “Northern Futures” discussion (see http://northernfutures.dialogue-app.com). 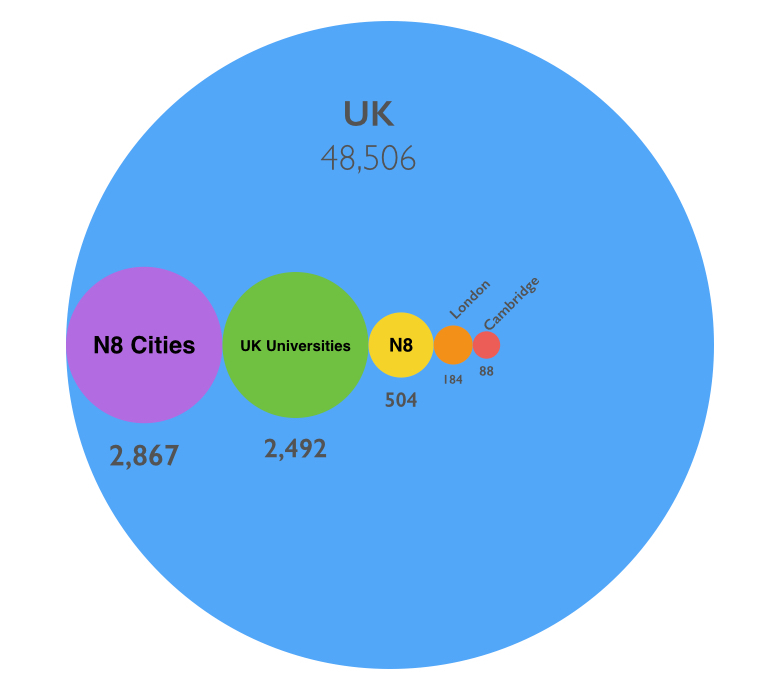 The results of our work shows that the N8 Cities have produced 2867 patents in the previous 10 years, of which 504 came from the N8 universities (Durham, Lancaster, Leeds, Liverpool, Manchester, Newcastle, Sheffield and York). By comparison, UK output during this period was 48506 patents, of which 2492 came from UK universities. This data provides some insight into the relative patenting activity in Northern England, but it also shows the significant contribution that non-university sources make to the intellectual property asset registers of our major cities. Our analysis used the IDM Analytics ™ Platform, which has been developed by Impact Science and provides a rapid and comprehensive view of knowledge economy skills base capacity and assets, including scientific publications and patents. Please contact Dr. Geoff Wainwright (Geoff.wainwright@2bio.co.uk) if you want to know more about this study, or if you are interested in finding out what the IDM Analytics ™ Platform can do. Posted in News on October 8, 2014 by impactscienceip. Today, the question of devolution is high on the lips of everyone in the UK and whether Scotland stays in or out of the Union, the talk of devolution of powers has spread beyond it’s borders. Last Friday, GVA (www.gva.co.uk) hosted a Core Cities Summit that brought together a group of high-profile panelists from the public and private sectors to discuss the value that the UK’s core cities have to contribute towards economic growth. Whilst key themes around transport, policy, and finance were raised, a common theme was understanding the skills, expertise and unique offering those cities have that can propel forward business growth in the knowledge economy. Impact Science have been working in partnership with GVA Ltd to map the research skills and expertise, and technologies being developed in our UK cities. Impact Science has developed a unique Knowledge Platform for rapidly identifying key strengths, differences and opportunities our core cities have in key industrial sectors. We are using data from a variety of public sources to, together with cutting edge visualisation techniques, simplify the presentation of tens of thousands of data points to answer those questions. We are defining the DNA of cities’ skills-base and enabling this to happen in minutes, not weeks. 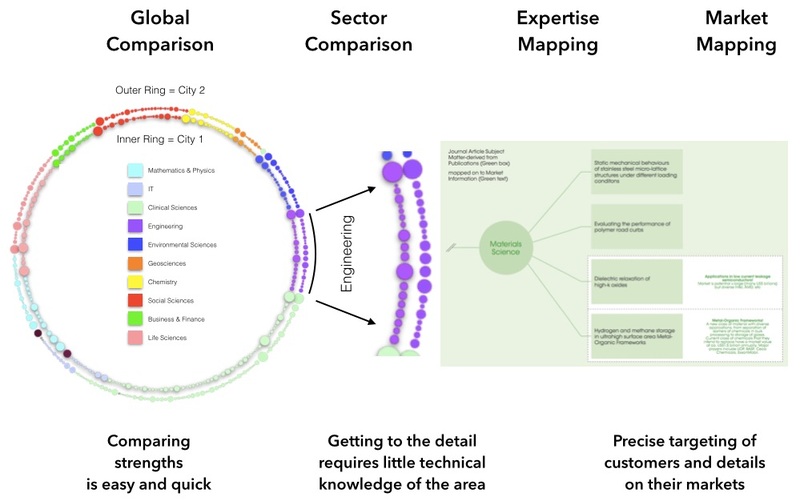 This type of analysis is used by our clients to identify where global expertise lies in technology areas, or to provide an analysis of opportunities and future trends in a market segment, or even entire cities and countries. It is cutting through the complex language often associated with technology areas, and enabling key decision making to move forward based on a solid foundation of data and analysis. Contact Geoff Wainwright to find out how our unique tools can empower you to make the right investment decision today. Posted in Uncategorized on September 15, 2014 by impactscienceip. Posted in Uncategorized on June 17, 2014 by impactscienceip. The new building is dedicated to research and business training for the biotechnology sector of the Center for Neuroscience and Cell Biology and the University of Coimbra and it represents an investment of EUR 12.5million. During the day the president toured Biocant Park and visited the companies and research laboratories based there, pointing out that Biocant is a very good example of the use of European structural funds. 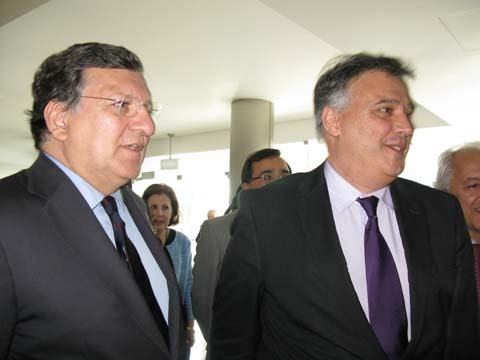 President of the European Commission, José Manuel Durão Barroso with Dr. Carlos Faro of Biocant. Posted in Uncategorized on April 29, 2014 by impactscienceip. Funding for Fusion Implants Ltd.
A company that helps dogs overcome lameless and restore mobility through 3D printing, has received a six-figure investment. Fusion Implants, a biotech start-up company based in the UK, has recently received a six-figure investment to develop and market its products. The company has developed orthopaedic metal implants, using its patented 3-D printing technology, which provides much greater design freedom than conventional manufacturing techniques, and also allows them to combine solid and porous sections for optimum strength and biological performance. Their lead implant, which is for use in canine knee reconstructions, is already on the market and is being sold to veterinary practices. Investment has been provided by The North West Fund for Venture Capital, managed by Enterprise Ventures. Fusion Implants will use the funding to roll out its current product, employ a design engineer and finance new product development. Rupture of the canine cranial cruciate ligament (CCL) remains the most common orthopaedic problem seen in veterinary practices around the world and can cause knee pain and lameness. CCL surgery involves a portion of bone being removed from the tibia to allow the restructuring of the angle of the knee joint, which is subsequently held in place by an implant. The Fusion Implants team have devised a way to manufacture high-performance veterinary implants from titanium using 3D printing, or additive manufacturing as it is also known. Fusion Implants’ technology allows the mass manufacture of porous titanium material, which allows the animal’s bone to grow into the implant, forming a natural bond and improving performance considerably. The Impact Science team provided the commercial support for the start-up process, including market research, business planning and intellectual property advice. Dr. Rhys Roberts of Impact Science said “we are very pleased that this technology has moved up to the next stage, and that we were able to introduce the Fusion Implants team to Enterprise Ventures. Posted in Uncategorized on April 1, 2014 by impactscienceip. Researchers at Singapore’s A*STAR Institute of Materials Research and Engineering (IMRE) have developed a remarkable new technology which promises to speed up the process of discovering vital new therapeutic drugs. The inventors, Dr. Madhavan Nallani and his team, were recently recognised by the last Asian innovation Awards, held at the Four Seasons Hotel in Hong Kong, where host and former UK Prime Minister, Sir John Major, discussed the huge potential benefits of the invention with Dr. Nallani. The invention allows polymers to be formed into structures that mimic natural cell membranes, and into which proteins can be inserted to represent the proteins found on real cells. This artificial system can be used as a very sophisticated laboratory model to understand how drugs interact with human cells in diseases such as Diabetes, Cancer or Parkinson’s Disease. The process that is generally used by the pharmaceutical industry for finding and developing new drugs, uses real cells that are grown up in large-scale cell cultures, which are engineered to produce a new proteins on their membranes, to represent key elements that may be affected in a human disease condition. These proteins are called ‘receptors’. The cells are then exposed to large numbers of potential drugs to work out which ones stick to the ‘receptor’ and therefore could affect the human disease. By using this screening process, pharmaceutical companies hope to find the needle in the haystack, and develop these drugs into new medicines. The problems with this approach are that engineering and producing large batches of cells is a lengthy process, and real cells also have a lot of their own natural receptors that can confuse the screening process. The IMRE artificial cell membranes are easier and cheaper to produce than real cells, so using this innovation, drug screening can be performed more quickly and cheaply than before, with the removal of background ‘noise’ caused by the myriad of other receptors found on real cells. The team in Singapore are now developing the technology for commercial application, and expect to spin this out into a new business very soon. Impact Science have been engaged to manage the transition from the research laboratory to a commercial business, which will offer improved drug screening services to the global pharmaceutical industry. Rhys Roberts of Impact Science said: “this is a very promising new technology that will be a game-changer in the drug discovery services market. We have been working with Dr. Nallani and his team for more than 2 years and together we have built firm foundations for a valuable new business”. For further information, contact Dr Rhys Roberts on +44 151 795 4100. Posted in Uncategorized on January 24, 2014 by impactscienceip. The Royal Liverpool University and Broadgreen Hospitals NHS Trust (RLBUHT) has entered into a partnership with Impact Science to create and manage a framework for the Trust’s Intellectual Property. The Royal Liverpool University Hospital is the largest hospital within the Trust, providing emergency, general and specialist treatment to patients, with more than 700 beds. The Hospital’s research and development portfolio is one of the largest portfolios of clinical research in the North West of England with over 400 clinical research projects covering many disease areas including cancer, gastroenterology, oral health, stroke, ophthalmology, infection and pharmacology. The addition of capabilities to protect and manage the IP associated with this valuable research activity is a logical progression in the Trusts plans to grow its portfolio of innovative activities. Under this new partnership, the Impact Science Team is evaluating the Trust’s current IP portfolio and implementing practical systems to both manage the current portfolio and uncover new IP owned by the Trust. Through this arrangement staff involved in research, development and innovation will have access to specialist support from the Impact Science Team, including guidance and training on IP issues, and support for commercialising inventions and innovations. Rhys Roberts of Impact Science said “we are very pleased to be working with RLUBHT, and recognise the huge potential of its clinical research portfolio to generate and add value to IP”. Posted in News on January 24, 2014 by impactscienceip.